All Kishoreda Fans Check Out This Page! What does his handwriting say? Those Kishoreda fans who may not know about this one, should check out the embedded link in the above photograph. 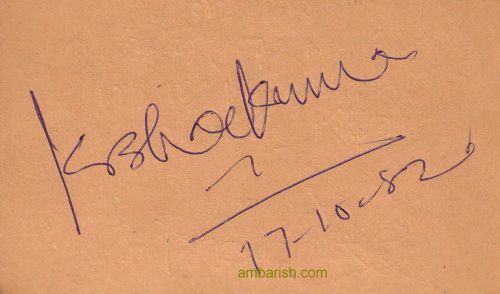 Ambarish Goswami, a Senior Scientist at Honda Research Institute, California, has uploaded Kishore Kumar’s autograph and some rare print media images and covers on his website. The images provide you yet another look into KK’s enthralling persona and the various moods he had had. Thanks Ambarish for coming out with this kind effort on your part! THE SONG IS “EK SAABJPARI MERE KHAWABO MAIN KABI ATI HAI KABIJATI HAI” .